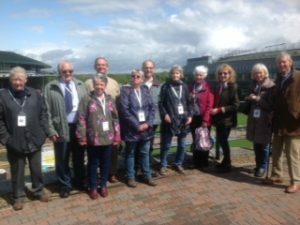 On 2nd May the minibus visited the home of the All England Lawn Tennis and Croquet Club. The weather was typically Wimbledon, a mix of sunshine and showers, but as much of the guided tour took place inside this did not matter . An excellent tour guide took us on a behind-the-scenes tour of this famous sporting venue – the museum was both fascinating and informative on the history of the game; we also visited the Centre Court and the Aorangi Terrace, now affectionately known as Murray Mound or Henman Hill, whllst learning about the rich heritage of Wimbledon. We went inside the press interview room and visited the exclusive Millenium Building usually reserved for only high-profile tennis players. Thank you to Kate for once again organising a great day out .